It's certainly not the first scene I'd planned to illustrate but, like I said, this one drew itself while I was sitting in the car waiting for my son. The scene I would like to do is the one with Malfoy and Harry on the train. Still mulling over the most effective perspective on that one. 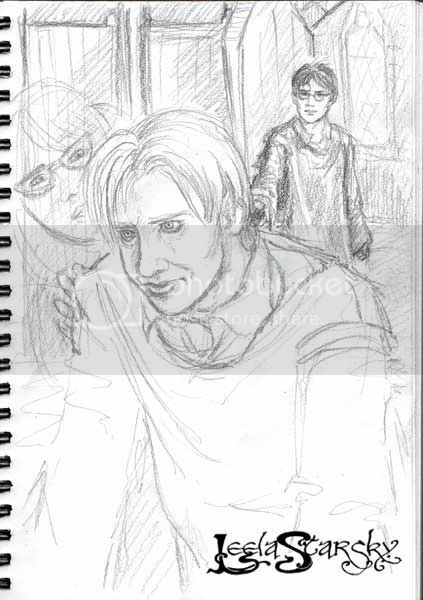 I think the reason people are drawing this is taht this scene shows us a different perspective on Draco. He's lonley, he's human and he's scared. He's also allowing himself to be comforted by Myrtle, which is amazing in itself LOL. Who would a thunkit?